Types of insulation include PVC, HR PVC. The inner & outer sheaths can be PVC, HR PVC, FRLS, HR-FRLS or FR depending upon the application and requirement of customers. Manufactured from bright-annealed 99.97% pure bare copper conductors these cables have low conductor resistance. The inner cores are insulated with a special grade XLPE compound. The tough robust outer HR PVC jacket protects it from the oils, greases, various chemicals and abrasions, thereby giving long life and electrical safety. 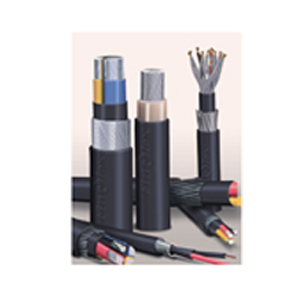 These cables are used for under ground as well as over head transmission of power to the control panels in power plants, industries, projects and all the electrical installations. Different variations such as round solid conductor / stranded conductors, taped inner sheath / extruded inner sheath, Round steel / aluminum wire / Flat galvanised steel strip Armored/ unarmored, single / double outer sheathed etc are available. Types of insulation include PVC, HR PVC. The sheath can be PVC, HR PVC, FRLS, FR or HR-FRLS depending upon the application.